There is one very clear place where developers and search engine optimization specialists are at odds. That is use of abbreviations and word fragments. ‘Devs’ like ’em. Search engine specialists hate them. We SEOs especially hate when those acronyms, abbreviations, symbols and word fragments make their way into page titles, meta descriptions and URLs. It can be argued that there is a place for short bits and pieces of words in SEO – but they must nearly always be secondary to complete words – because full length words are used far more often by customers to search for most products and services. My favorite web acronym is TL;DR for “too long, didn’t read” and this post may fall into that category for you unless you are having issues with abbreviations and word fragments hindering your search visibility. 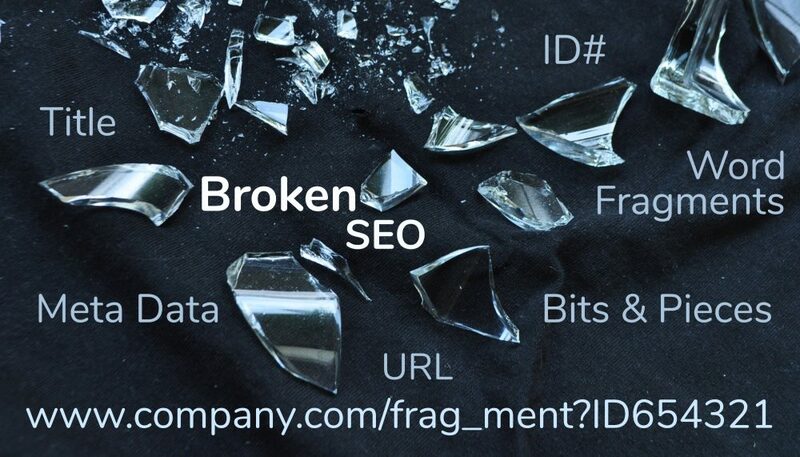 If you are seeing broken word pieces in your page text, titles or are seeing encoded URLs with unrecognizable code in them – the following information may prove useful. If 1100 words here is too much for you (TL;DR) then everything is summed up in the last two sentences at bottom. So let me ask you, have you ever searched Google for “Assy” when you need an assembly? Have you searched for a “Htr” when looking for a heater? Maybe you’ve searched for “AC” when looking for air conditioning? But how about “LH” when you need anything for the left hand side? These examples are a very small group of corrections recently made in web site title tags and meta descriptions for a car parts retailer. Those abbreviations were automatically applied to page titles, meta descriptions and URLs in a catalog of literally hundreds of thousands of parts. Fortunately we were able to do large-scale database search and replace to accomplish the task. This is where the water gets muddy. Some numbers are good and some are bad for SEO. There is a strong case to be made for all manufacturer part numbers to be included in product page titles, meta data, and URLs. Especially when the customer needs to distinguish between that same replacement part that can be sold by hundreds of retailers made by aftermarket manufacturers. Original Equipment Manufacturers (OEM) provide unique product part numbers which repair shop technicians routinely include in their Google searches to distinguish between dozens of variations available for the same or similar car part. Those part numbers are unique for different colors, materials, sizes, model and year of manufacture of the same part. This would be true of automotive, industrial machinery, major appliances, tools, and dozens of other industries. I mentioned muddy water – so where’s the mud? Internal IDs are the bad numbers. Nobody needs your secondary in-house codes for anything. This is a random alpha-numeric identifier for internal record-keeping only and should never find it’s way onto visible page text or titles, meta descriptions or even URLs if not absolutely required by the platform. Your customer doesn’t search for your internal ID numbers – because they are not relevant to them. Some content management systems require unique page ID’s to publish a page. Unless those numbers are more than 6 or 8 digits long, I’ve acquiesced and allowed it – but only if the product or service name is also included in that URL. The worst possible scenario is where both word fragments and database ID’s find their way into page titles, meta descriptions or URLs. In one case I have argued against a system that was being pitched to a client by sales reps for a new content management platform. That system appeared to be designed by developers intent on eliminating any editorial participation. Not only did it auto-generate those important page titles, meta descriptions and URLs using ID #’s and word fragments – there was no way to edit them. Turns out the sales pitch was mostly focused on cost savings – definitely not on SEO. That’s the use of the first letter of a string of words to form a new word (National Aeronautics and Space Administration [which gets 13k search volume] or NASA [450k search volume]). Acronyms are mostly overused in other scenarios where the acronym has not become a replacement for the words that make up the new shortened word. The way to decide whether (and how) to use an acronym is to figure out search volume and decide which is appropriate for your particular unique phrase. If you sell “Kids Orange NASA Jump Suits” then it’s fine and appropriate to use NASA in your entirely unique phrase. However, if you are publishing an article titled “NASA Space Launch” then it’s unlikely to ever be seen on a search engine because you are competing with every national news outlet and thousands of space enthusiast bloggers for a phrase that many of them will use. Similarly, using the acronym SEO in most titles will also mean it will never be seen on a search engine. There are too many SEO’s trying too hard to rank for every competitive phrase. What about Symbols and Accents? Google has stated that Copyright © , Trademark ™ and ® aren’t treated differently when used with brand names. So brand managers can continue to insist they be appended to brand names where required. However, diacritics used when typing words that include them can break URLs and cause title tags to create odd strings of characters which are not recognized as words. á, å, ä, â, ā, ą, should all become the unaccented “a” in urls. í, ï, ī, should become “i”. ó, ø, ö should become “o”. ú, ū become “u”. ê, ē, ę all become “e” and each of the following ș, ț, č, ć, đ, š, ž, č, ģ ķ, ļ, ņ, ł, ń, ś, ź simply become their unaccented versions to avoid breaking URLs. If your content management system doesn’t replace Häagen Dazs with Haagen Dazs (no diaeresis), then it will cause the URL to use the encoded version of that ä to produce a URL that looks like /h%C3%84agen-dazs/ instead of the intended /haagen-dazs/ which breaks URLs and may then cause 404 errors from any links. If your CMS is well written, it will replace that accented ä with the unaccented “a” instead. Never use word fragments or abbreviations in HTML title tags, URLs or visible on-page text. Go ahead with Copyright © , Trademark ™ and ® on-page and in meta descriptions, but definitely keep all symbols out of URLs. This may require customization of your CMS so symbols don’t by default get automatically encoded, but are instead automatically removed from URLs.